The five permanent members of the U.N. Security Council and Germany agreed Tuesday to impose new sanctions on Iran over its suspect nuclear program, yet the measures appeared to fall short of what the Bush administration had wanted. After months of diplomatic bickering and U.S. pressure, Washington and its European allies overcame strong Chinese and Russian resistance to a third U.N. sanctions resolution and they all approved a draft that expands and strengthens the penalties that were in the two earlier ones. The draft was presented as a sign of international resolve that Iran should not be allowed to develop nuclear weapons and unity on the need to press the country into suspending its uranium enrichment that can produce material needed to make the bomb. But the document, hailed by U.S. officials as a victory for the Bush administration's tough line on Iran, was not released. And participants in the two-hour negotiating session that produced it here pointedly refused to discuss details. In addition, the foreign ministers of the six nations represented - Britain, China, France, Russia, the United States and Germany - canceled a planned news conference and left it to the host of the meeting, German Foreign Minister Frank-Walter Steinmeier, to announce the result. "We are united in the assessment that nuclear armament of Iran would have dramatic consequences for the Middle East and even beyond," he said. "So we are and remain agreed that we must and will continue to work ... to ensure that it does not happen." Secretary of State Condoleezza Rice and Russian Foreign Minister Sergey Lavrov, who have had bitter disagreements over Iran, looked on impassively as the German foreign minister announced agreement on the draft. The group had entered the Berlin meeting divided on four distinct issues, but after heated discussions - primarily between Rice and Lavrov - managed to reach agreement, U.S. officials said. They would not identify the points of contention. U.S. and European diplomats said the draft, to be presented to the other members of the Security Council in the coming days, bolsters existing sanctions, notably asset freezes and travel bans on Iranian officials. But they disagreed on whether it contains new measures. A senior U.S. official insisted that the resolution does have "new elements," but declined to elaborate on what they were, while a European official said the draft does not feature additional economic sanctions. "This resolution builds on the last two resolutions," the U.S. official said on condition of anonymity due to the sensitivity of the matter. "It increases the severity of the sanctions and it expands the sanctions in some of the categories." The official referred specifically to travel bans and asset freezes but also said the draft "has some new elements that will be unveiled in New York." It was not immediately clear what those would be or how the comment could be reconciled with that of the European diplomat. The U.S. has been pushing for sweeping new sanctions, mirroring unilateral measures it imposed last year on select Iranian banks and elements of Iran's military. 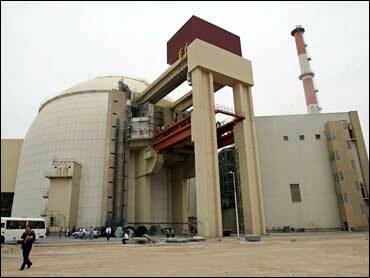 But Russia and China, which along with some European nations have significant investments in Iran, had balked. U.S. and European officials said that all participants would vote in favor of the resolution, indicating that the Russians and Chinese may have succeeded in pressing their objections to the wide-ranging sanctions sought by Washington. The ministers had last met in September and agreed to proceed with a new resolution within two months. But after the release of a new U.S. intelligence report in December that determined Iran had halted its nuclear weapons program in 2003, that initiative seemed to have faltered. U.S. officials said Tuesday's agreement was a sign that the National Intelligence Estimate findings, which came as a surprise to many, had not dampened international concern about Iran. In his statement, Steinmeier stressed that all six nations stood behind the two-pronged carrot and stick approach to Iran, which offers Tehran incentives if it suspends uranium enrichment or further sanctions if it refuses. However, Iran has remained defiant, insisting it has never had a nuclear weapons program and saying its work is for peaceful purposes such as energy production. Iranian Foreign Minister Manouchehr Mottaki said Tuesday that his country opposed the spread of weapons of mass destruction and voiced confidence about Iran's cooperation with the U.N. atomic watchdog.